"A variation from the traditional macaroni or pasta salad." Fill a pot with lightly-salted water and bring to a boil. Stir in the shell pasta and cook until the pasta is tender but firm to the bite, about 11 minutes; drain. 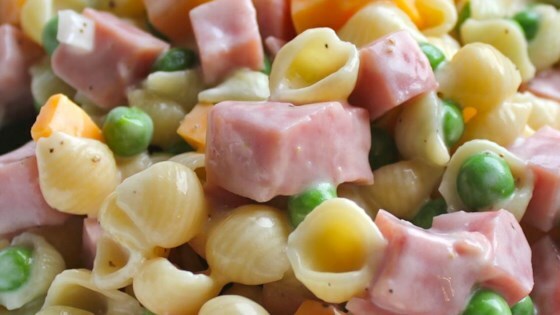 Stir the peas, ham, Cheddar cheese, onion, mayonnaise, vegetable oil, lemon juice, salt, and pepper in a large bowl; add the cooked pasta and stir to coat. Cover and refrigerate 1 hour, or until completely chilled, before serving. This is a great basic pasta salad! Although, I did omit the oil and lemon juice. I also did not add salt as there would be plenty of salt from the ham. Other than that, it was delicious! Very good recipe, will make again. Everyone in my family enjoyed this recipe. The second time I made it with ring pasta, and we liked that even better than the shells. I used shredded cheese for the convenience. This was a nice base. I didn't have any peas so I used green onions for color and added chopped hard boiled egg.I didn't measure any ingredients but I know I used a ton more mayo than called for. I ground the ham in my food processor, and added more mayo. There were no leftovers!